Pass the Pigs is a cute, quirky dice game that’s easy to learn and play. I’d recommend it for all ages six and above, since the rules don’t specify a range. Pass the Pigs requires virtually no setup, as the only game pieces involved are the two pigs and a score pad. Assign a swineherd (or scorekeeper), and select who’s up first. The first little piggy – er, player – rolls the pair of hogs onto a flat (not muddy) pasture. The player then consults the instruction booklet to determine the meaning of the pigs’ acrobatics. Pigs may land both on the same side (called a Sider), standing up (Trotter or Double Trotter), on their back (Razorback or Double Razorback), on their nose (Snouter or Double Snouter), on their jowls (Leaning Jowler or Double Leaning Jowler), or any combination thereof (Mixed Combo) to score points. Like in the dice game Greed, players can keep rolling to try and get more points. Be careful, though, because certain throws are negative. Being too greedy for points could lead to a Pig Out, where if the pigs rest on opposite sides (branded by a black dot), you score zero for that round.Makin’ Bacon is a very harsh rule: you lose ALL points accumulated thus far in the game if your two pigs touch each other at all. And if your hogs are caught engaging in a Piggyback (one pig on top of the other’s back), you’re out of the game! You won’t have to wait until pigs fly to win, as it only takes 100 points to bring home the bacon. 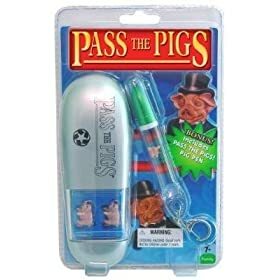 I was first introduced to this game by my aunt as a kid, so now as an adult I can see how Pass the Pigs is fun for any generation. It’s a lot more interesting than your average dice game, and it even has a “Hog Call” version where players can predict how the piggys will land to rack up (or lose) a ton of points. It’s suitable for travel, as the small number of components won’t cause a pigsty. I’d say that the risk of losing one of the pigs is the only con of the game, actually. Pass the Pigs is an adorable game of luck that will amuse both young and old. The pig dice are so cute you just might think twice about eating that BLT.